While not as popular as stir-frying, deep-frying is a common Chinese cooking technique. Here are answers to the most commonly asked questions about how to deep-fry. Read them over, and when you're ready to start deep-frying, try these deep-fry recipes. 1. Do I need to use a wok for deep-frying? No. Some people feel safer sticking with a deep-fat fryer. If you do use a wok make sure it is securely in place - flat-bottomed woks work best for electric ranges; round bottomed for gas stoves. (Make sure the round bottomed wok is securely in place in the wok stand). Chinese New Year of snake 2013 is coming soon, the grand festival will be celebrated on Sunday, February 9 and lasts for 15 days till Lantern Festival on Sunday, February 24. The biggest important reason that Chinese people greatly value is because Spring Festival is an excellent time for families to be together. 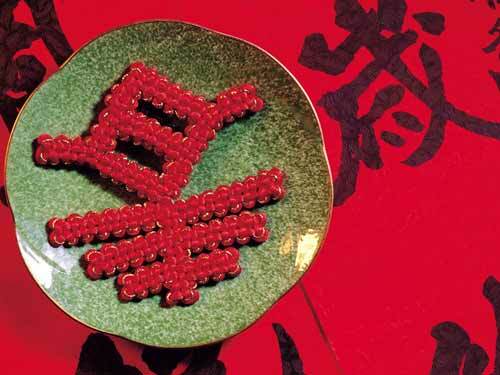 During that time, a reunion dinner is held on New Year's Eve. 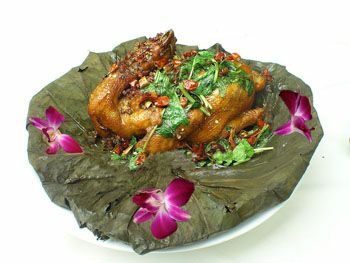 Because it is the most important dinner of the year for Chinese people, the recipes are required to be both meaningful and delicious. 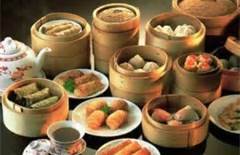 Now Let’s have a look at what kinds of food often appear on Chinese New Year's Festival Dinner. 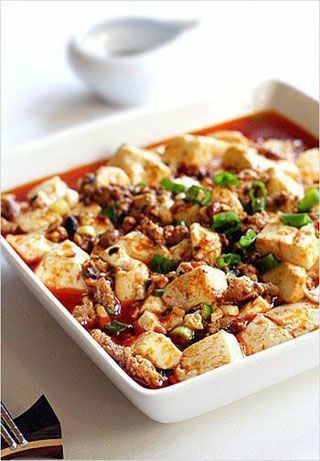 Mapo tofu (má pó dòu fǔ 麻婆豆腐) is the most famous and easiest kind of Sichuan food and also the spicy taste also makes it very popular.True Mapo doufu is powerfully spicy with both conventional "heat" spiciness and the characteristic "mala" (numbing spiciness) flavor of Sichuan cuisine. The feel of the particular dish is often described by cooks using seven specific Chinese adjectives: numbing(má 麻), spicy hot(là 辣), hot temperature(tàng 烫), fresh(xiān 鲜), tender and soft (nèn嫩), aromatic(xiāng 香), and flaky(sū 酥). These seven characteristics are considered to be the most defining of authentic Mapo doufu. The authentic form of the dish is increasingly easy to find outside China today, but usually only in Sichuanese restaurants that do not adapt the dish for non-Sichuanese tastes.It is said that Ma Po bean curd introduced to Japan after the bags were made of fast food, "Mapo tofu." 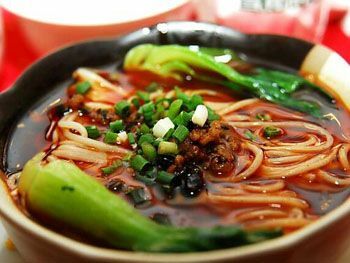 Dan Dan Noodles (or Noodles, Sichuan Style/dàn dàn miàn 担担面) is another classic Sichuan dish that one shouldn’t miss out when you’re in Chengdu. This sack is a kind of hot-spiced noodles or spicy peanut noodles.It is favored with a sauce containing dried shrimp, shredded preserved vegetables,crushed roasted peanuts, sesame seeds, chilli oil,soy sauce,vinegar and garlic. The one thing you’ll find in every recipe for Dan Dan Noodles is a spicy sauce that includes sesame paste (peanut butter makes a handy substitute) and hot chili oil. Most include roasted Szechuan peppercorn, although this is sometimes left out of the sauce and served as a garnish instead. Dan Dan noodles can be found at many street food joints all over Chengdu. Approximately RMB5 per bowl. In China, there are many dishes where the name originated from a folklore, legend, or story. Beggar’s Chicken (jiào huā jī 叫化鸡) is another dish with an interesting history.This dish of Beijing origin, Beggar's Chicken also called "jiaohua ji" in the Shanghainese dialect, and the chicken is stuffed, wrapped, and roasted in this traditional Eastern Chinese recipe also this dish is very popular with Far Eastern gourmets.